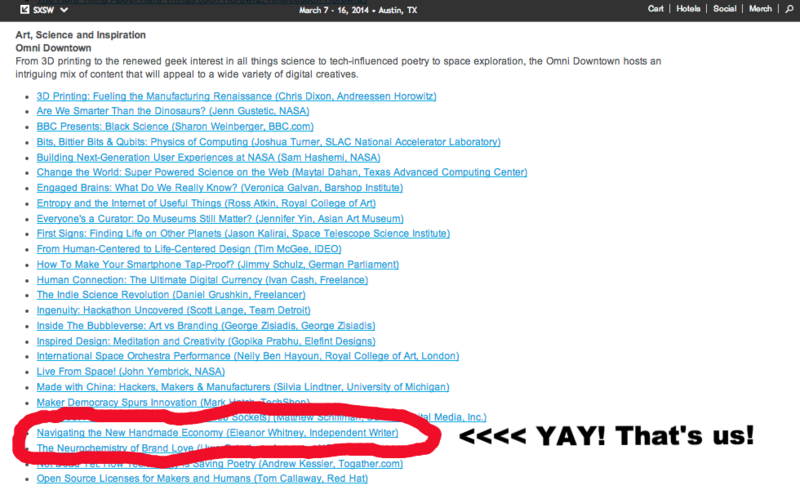 We are so excited to announce that our panel was chosen to be presented at SXSW Interactive. The panel is titled Navigating the New Handmade Economy and along with co-founder Sharon will feature members Eleanor Whitney (writer of Grow) and Carol Cho (business development at Etsy)! SXSW is an annual conference that focuses on multiple creative genres (music, film, gaming, etc.) and while their Interactive festival has become the premier tech conference, it has also greatly expanded to look at how makers are inherently part of the tech sphere. In case you are not familiar with the process, SXSW says it picks speakers and panels through "a modified crowdsourcing approach where 40% of the decision-making process on any given proposal comes from the SXSW Advisory Board, while 30% comes from online voting and 30% comes from SXSW staff input." Thanks to all of you who helped with influence in the 30% online voting... we know it was helpful! So what does this mean for you and other makers? It raises the visibility of unique issues that makers face in front of a national and influential audience, particularly those in tech (a group that doesn't get to hear from us often!). We will be discussing online selling and how its been both a boon and tricky space to maneuver for makers. It means the start of having maker businesses seen as a vital and vibrant part of our economy, helping it to become more mainstream and less of a hobby or way to make a little extra money on the side. The Academy of Handmade itself will gain exposure and more people will get to see what our members are up to! That means your membership will become even more valuable. While in Austin we will be looking at ways to start chapters of the Academy outside of Southern California. If you have anything that you think could be of help to the panel or have a topic/angle that you think needs to be addressed, feel free to email academyofhandmade@gmail.com with your thoughts! Sharon and KC are also not independently wealthy... so getting to Austin will also take a village. We're going to be in need of lodging, flights, promotional items to bring to Austin... any assistance that anyone can provide with any of this will be appreciated.